The Pittsburgh Business Show was pleased to announce Gypsy Artistry, Smoke Detective, UnaTrades, Cruisin Tikis Pittsburgh, DisSolves and Crystal Clean Canz as their six participants for the Pittsburgh Business Pitch that took place over two days at the Show on April 25-26 on the main event floor at the David L. Lawrence Convention Center. This valuable opportunity gave these six participants the opportunity to present their business concept to attendees and sponsors with a winning prize of complimentary sponsored services and support to help them launch their company. These unique and cutting-edge local start-ups were provided with space to exhibit their business concept for both days of the Show. They were able to tell their story and explain their business concept to attendees throughout the event. Voting took place starting on Friday April 20th for Pittsburgh’s favorite business idea using a TEXT to vote system that is sponsored by FYRE, INC a Pittsburgh based business that helps businesses with their mobile marketing needs. Pitch participants also shared their ideas on social media to gain more votes. The business concept with the most votes won the sponsor services and support for their business. The 2018 WINNER WAs Gypsy Artistry! Gypsy Artistry, founded by Tanya Bashor, offers pop-up style art and crafting services to anyone who wants to take the hassle out of crafting and create a personalized craft. They will travel to your favorite winery, child’s birthday party, or fundraiser, bringing the supplies and the easy to follow instructions to get you started. Bashor hopes to take the fear out of art by providing her customers with the supplies and easy to follow instructions to make crafting easier. From flower arrangements and seasonal wreaths to paper crafts and painting, Gypsy Artistry has a craft for everyone. Bashor said having a booth at the show provides her an opportunity to explain how she can help small business owners increase their customer base with her services and provides exposure for Gypsy Artistry. “My vision is that Gypsy Artistry becomes a familiar name around Pittsburgh, and gets to be the buzz around town as this new fun way to spend an evening with friends! I want there to be at least one workshop per week available to budding artists to try their skills at a craft that they wouldn’t otherwise attempt,” Bashor said. Smoke Detective, founded by CEO Stephen Davis, has developed a patent-pending program that can turn any camera-enabled smart device into a smoke detector without the need for additional hardware or calibration. This user-friendly application will begin monitoring with the push of a button and will sound an alarm and send a mobile notification when visible smoke is detected. “Smoke Detective hopes to help dramatically reduce the damage and trauma caused by fires,” Davis said. He said to help make that dream a reality they will give the basic smart phone app away for free. 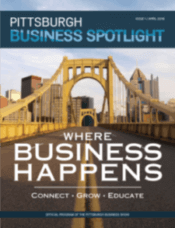 “We are excited about being part of The Pittsburgh Business Show and having the opportunity to introduce our program to many of the fastest growing companies in the Tri-state region. We are particularly pleased to be part of the business pitch spotlight where some of the newest and most innovative companies are showcased,” Davis said. Founded by Frank Polito, UnaTrades is an online marketplace like Amazon, Groupon, Angie’s List and many other major online marketplace websites that allow people to save money on products and services but also help them to make money too. What makes UnaTrades different is that when customer’s use their website to make purchases, customers earn 10% cash back on all their purchases. Customers and businesses can earn a 5% lifetime equity/royalty commission on all purchases made or sold by a business or customer that they personally referred to use UnaTrades. When a user signs up they receive their own personal referral link and promo code to use to get users to sign up and make purchases through the UnaTrades Platform. There is no fee to use the website, even for businesses who are using the platform to sell their products, making this service truly unique. Depending on the industry and partnership agreement with that specific business, UnaTrades receives a 25-30% commission. “There is no website or company in the world that offers this type of business model to the public for free and UnaTrades will be the first to do it headquartered out of Pittsburgh, PA!” Polito said. Founded by President David McCue, Cruisin’ Tikis Pittsburgh will be offering 2-hour tiki boats cruises on the Three Rivers beginning in May. The cost for these 2-hour sightseeing cruises will be $400.00 for up to six people. These charters will take customers on a beautiful and relaxing sightseeing trip of Pittsburgh, offering stunning views and photograph opportunities of the Pittsburgh landscape. Each boat can carry six people and are operated an experienced, fully licensed, and Coast Guard Certified Captain. Customers are welcome to bring their favorite beverages and snacks. A cooler with bottled water and ice will be provided as well. Custom charters are also available for events such as birthday parties, bachelor and bachelorette parties, sunset cruises, corporate charters, retirement parties. Multiple boats are available to accommodate larger groups. They also hope to have charters available for special events like concerts at Heinz Field, PNC Park, and Stage AE, along with Pittsburgh Pirate games, Pittsburgh Steeler games, and other riverfront events to help customers see Pittsburgh in a whole new way. Connect with Cruisin’ Tikis Pittsburgh to learn more. The Crystal Clean Canz company, founded by CEO Mark Shemansky, is a veteran-owned and operated family business serving both residential and commercial clients throughout Southwestern PA. This licensed and insured, professional garbage can and recycling bin cleaning service will have your cans looking and smelling new. They not only clean out your cans or bin, but they also disinfect, sanitize and deodorize them to remove harmful bacteria and diseases like E-Coli, Salmonella & Listeria that can linger in your cans. These cleanings also help to extend the life of your bins and help to eliminate the build-up of grime and grease. Licensed and insured, this affordable and eco-friendly solution is a great service for your home or your business. Crystal Clean Canz also offers a service where you can purchase cleaning services on behalf of your family or friends. They will send the recipient a personalized card with the cleaning service information. For commercial cleaning, they can provide affordable, quality service for 2, 4, 6, and 8-yard dumpsters at schools, restaurants, care homes, etc. helping business owners make a great impression on their customers. Connect with Crystal Clean Canz to learn more. DisSovles, founded by Pittsburgh native Jared Raszewski, is introducing an innovative form of dissolvable, edible packaging that can be used to package drink mixes, such as protein powder, baby formula, and water flavoring, in convenient pods, like Tide Pods. This dissolvable, plant-based packaging allows the powder to be fully contained and more portable that traditional packaging, leaving behind no mess or waste. Raszewski said their vision is to eliminate the need for measuring drink mixes, inconsistent serving sizes and the possibility of a mess by introducing a more convenient way to transport and use drink powders. “At DisSolves, we believe we have the potential to make everyday life easier while reducing our environmental impact,” Raszewski said. DisSolves packaging allows the consumer to pop of their favorite drink powder into their drink and go with no messes or waste piling up in a landfill. With high standards in food packaging, DisSolves uses natural, high-quality ingredients that are approved internationally for human consumption, while other companies have introduced edible packaging made entirely out of plastic. Raszewski said he has lived in Pittsburgh his whole life and attended the University of Pittsburgh where he developed the idea for this product. “As I grow and scale this business, I want to stay headquartered in Pittsburgh to stimulate the economy as much as possible,” Raszewski said. Connect with DisSolves on YouTube to learn more. The Pittsburgh Business Pitch is one of the first ever start-up business pitch programs and offers a once in a lifetime opportunity for start-up business concepts to win services to help them launch their brand and business in the Pittsburgh area and beyond. The Pittsburgh Business Show is excited to offer this program to Pittsburgh Area businesses at our 2018 event. To meet these businesses, purchase tickets to the Show and receive two-day discounted tickets good for all events on the 2018 agenda.